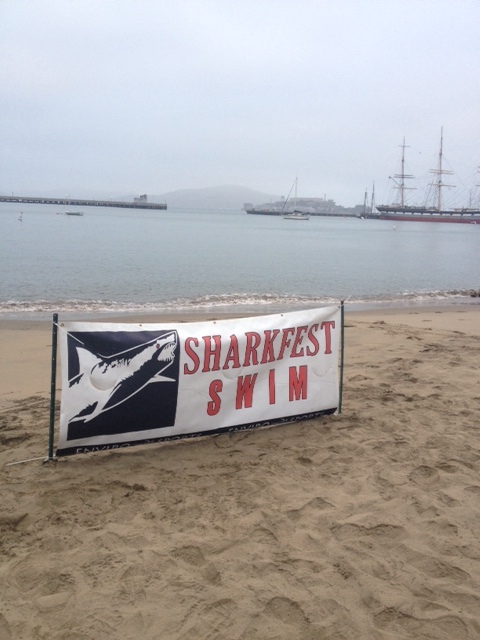 The weekend started out with SHARKFEST! 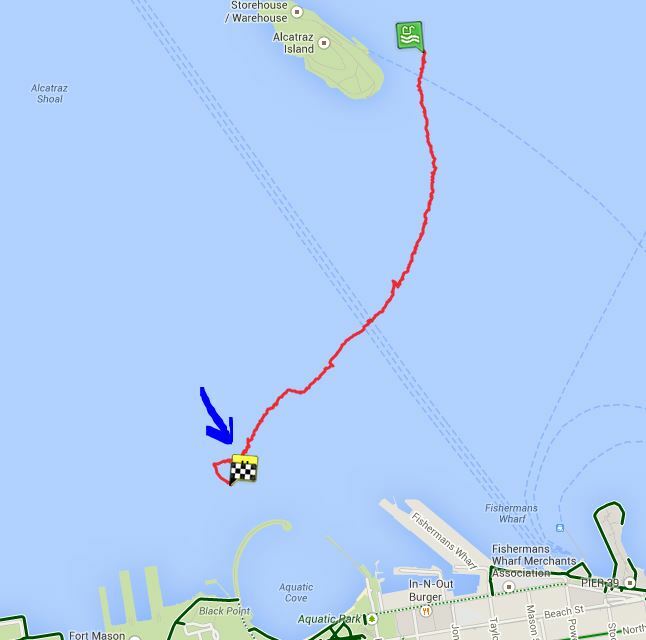 which is a swim from Alcatraz Island to Aquatic Park. This was my 6th run at it and so far it was Sharks 0/21CM 5. I intended to keep it that way but you just never know when you’re going to need a bigger boat. I was accompanied by my local friend Kathy and my long distance, creepy internet friend what I love, Dread Pirate Rackham. We suited up, including strapping on our Bias walked to the ferry, rode out to Alcatraz where we jumped off a perfectly servicable ferry, into 55 degree water. WHOO! Cold and shocking and then, there you are – out in the middle of San Francisco bay – WITH SHARKS! 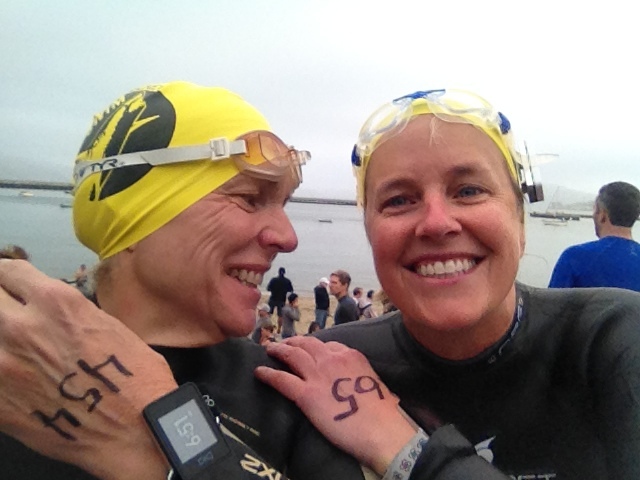 DPR and I attempted to stay together but it really doesn’t take long to get separated in a crowd of 800 swimmers. Good thing sharks don’t like crowds. Off I went, happily sighting off the lead boat and thinking I was doing so great! I would be with people then alone, then with people, then alone and then… disaster! SHARK ATTACK!! No, not really. I got such a wicked cramp in my leg I thought I was going to cry. A kayaker saw my sad, pained face and paddled over to see if I was okay. 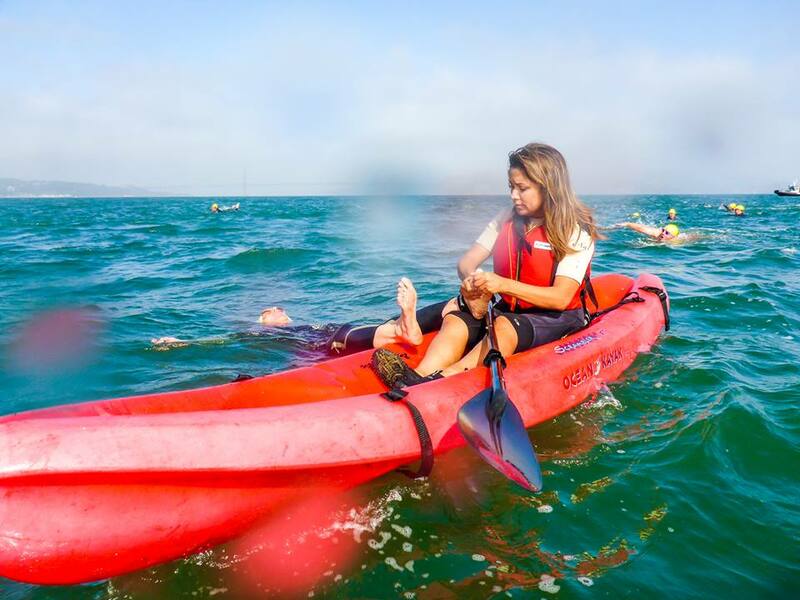 I ended up putting my feet on on her kayak and she was nice enough to massage the cramp away. This was a such a touching sight and such a fantastic example of how great the support is out there that someone snapped a picture so we can all enjoy my little swimming interlude. This picture also covers reason 2,367 of why I love the internet because it was posted on Facebook and I got a chance to thank this lovely young woman for helping me out. I wanted to hug her but I was still pretty far out and still wanting to get to shore before a shark ate me that I took off. Only problem was I took off heading a little too far west, and got caught in the current AGAIN! (just like last year). You can see how quickly I got dragged out and let me tell you, once you get caught in that current you are not likely to get out without assistance and so, for the 2nd time on the day, I got help. This time it was from an SFPD guy on a ski-doo with a sled thing on the back. I climbed up and held on for dear life while he trolled the waters for others to rescue. He picked up another guy and we crossed arms and hung on for dear life while this cop drove like a maniac, twisting and swerving all over the place – it was awesome! I wish I had left the Bia on because I’m sure it would have been an interesting path. Anyhow, he got us to the opening of Aquatic Park where we rolled off and swam to shore, chagrined but happy to be alive, all limbs attached. 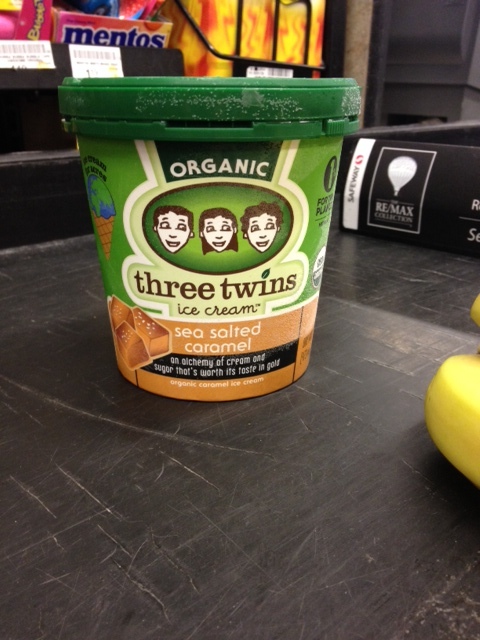 I was also frozen – it took until I got changed and into a heated car to stop shaking. We did what any sensible people would do and went out for a giant breakfast – yum! 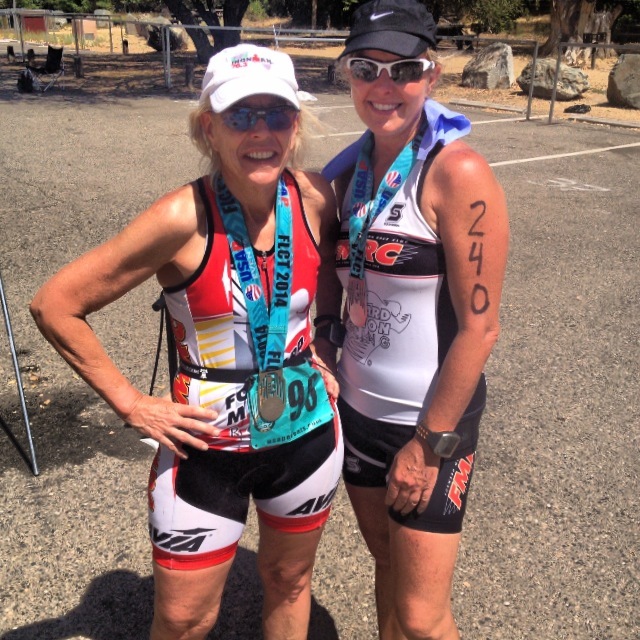 After that I drove home, met up with my training partner, Kaaren and off we went to Folsom because we were racing Folsom Long Course Triathlon! Do I hear your head ringing with the word BADASS?!! I believe I do! 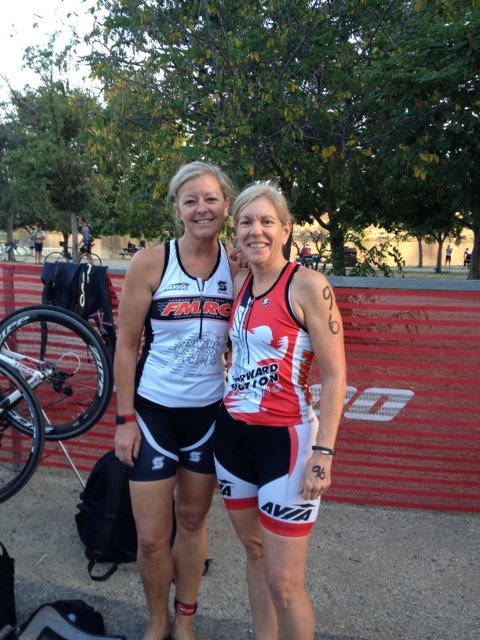 Here we are pre-race – so fresh, so ready to conquer the day! You can’t even tell it is 6AM because as you can see, it is so very bright and sunny! Our swim wave went off at 6:36 and that part went okay. It seemed a little long but doesn’t 1.2 miles of swimming always seem a little long? The water was nice, though. The bike was good. I loved the course and the intersections were well managed and protected and it didn’t seem that hot. I probably should have gone a little harder but I knew I had long, hot run coming up so I held back a little. Did I mention hot? Holy Hell, people, it was 105 out there. The second I started running I thought, “You’ve got to be kidding me – no way!” But on I went. I stopped at every aid station and put ice down my bra, down my pants and in my hat. I drank, drank, drank and I ran when I could. I managed to run from one aid station to the next for a long time but after about 10 miles it didn’t even seem like a good idea. I figured there was no sense in dying out there so I walked a bunch of the last 3 miles. And then I was done. And here we are, burned to a crisp, fried in every way and wearing our much deserved medals. HOLY HELL! 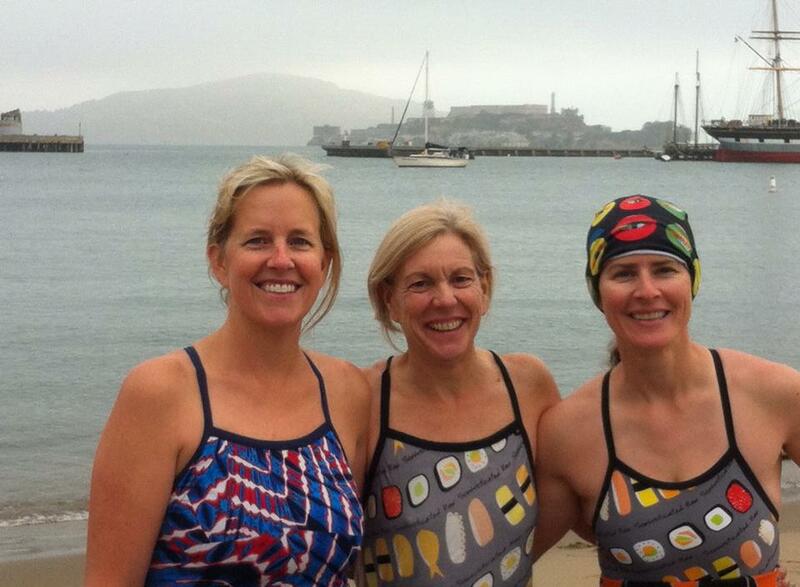 you swam alcatraz and did a half-iron on the same day?!? !